The prize for this week’s best performing currency against the US Dollar has to go to the Canadian Loonie which gained an impressive 4.3% moving from 1.16 to 1.11 with the pair now taking a well deserved breather. Yesterday’s candle was indicative of this exhaustion after such a steep fall, ending the session as a small doji which is likely to be replicated in today’s trading. 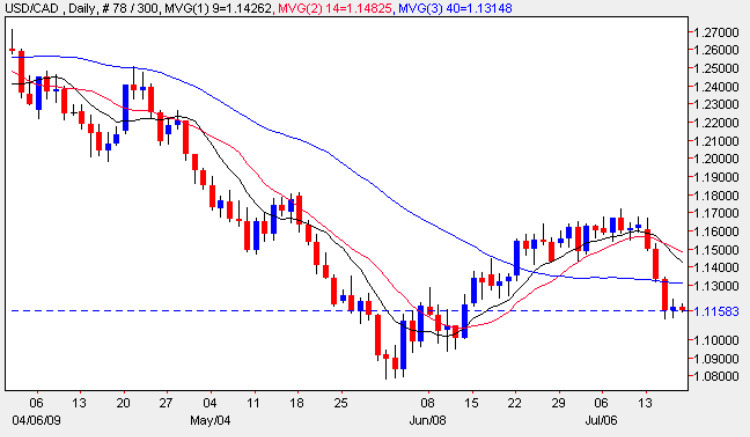 Having penetrated the minor support at 1.13 price handle and with all three moving averages pointing firmly lower, any minor reversal will no doubt promptly squashed by the bearish tone of the chart. The only question now is how soon we are likely to see the re-test of the 1.08 support region which provided the impetus for the rally from mid May. The only items of fundamental news on the economic calendar for the US were the housing start figures which came in better than expected thereby maintaining risk appetite, while for Canada we have had the CPI data all of which came in exactly as forecast.